A delightful sugared shortbread cookie, supersized and decorated with smooth royal icing. Ideal as a birthday gift for a loved one or as a happy gesture to yourself. 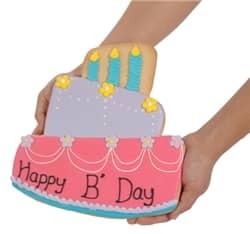 Delight yourself or your loved one with our giant Birthday cake shaped sugar cookie. Freshly baked shortbread sugar cookie dough supersized into a giant birthday cake shape and topped with royal icing and a Happy Birthday Greeting. Each giant sugar cookie is individually boxed with an elegant satin ribbon.